Three stories in one! Join Rachel and Kirsty for a magical adventure with another fairy friend in this bestselling and much-loved series for girls aged 5 and up! Evelyn the Mermicorn Fairy has a very special magical pet. But when Jack Frost steals him away from her, the magic of the mermicorn is in danger! Can Kirsty and Rachel help get him back? 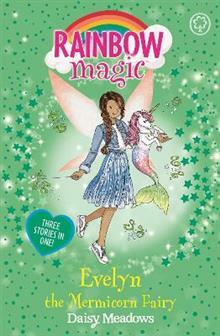 Have you read any other Rainbow Magic books? Try Ruby the Red Fairy to find out how Kirsty and Rachel's adventures began.